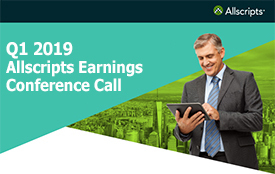 CHICAGO, Feb. 10 /PRNewswire-FirstCall/ -- Allscripts-Misys Healthcare Solutions, Inc. ("Allscripts") announced today that its Board of Directors has approved a stock repurchase program under which Allscripts may purchase up to $150 million of its common stock over the next two years. Repurchases may be made pursuant to Rule 10b5-1 or 10b-18 of the Securities Exchange Act of 1934, as amended. Additionally, Allscripts has entered into a Stock Repurchase Agreement with Misys plc and certain of its affiliates (collectively, "Misys") whereby Misys has agreed to participate in the repurchase program by selling to Allscripts the number of shares of Allscripts common stock needed to keep Misys' ownership percentage in Allscripts unaffected by the open market repurchases. Repurchases of Misys' stock will be made at the weighted average price at which repurchases are made by Allscripts under the open market plan. All repurchases under the program are subject to compliance with applicable laws and regulations. The aggregate amount of shares purchased pursuant to the repurchase plan, whether pursuant to any 10b5-1 plan, Rule 10b-18 or from Misys, will not exceed the lesser of $150 million (including commissions) or 15 million shares. There is no guarantee as to the exact number of shares or value thereof that will be repurchased under the stock repurchase program, and Allscripts may discontinue purchases at any time. "Improving the quality and cost-effectiveness of healthcare through technology is among the most important of our nation's priorities and, consequently, we continue to see a vibrant market for the electronic health record, electronic prescribing, information and connectivity solutions we offer," said Glen Tullman, Chief Executive Officer of Allscripts. "Given our large base of healthcare providers, the strength of our solutions and our financial performance, we believe Allscripts is a very good value in this market. We plan to use our strong balance sheet and cash flow to initiate a share repurchase program that will benefit all of our shareholders and will capitalize on the underlying value of Allscripts and our position as the clear leader in the healthcare information technology industry." Allscripts also announced today that it has entered into an amendment and restatement of its credit facility (the "Credit Facility") agented by JPMorgan Chase Bank, N.A. which increases commitments under the facility by $50 million to $125 million and adds Fifth Third Bank as syndication agent and co-lead arranger. The Credit Facility also may be expanded by an additional $25 million to $150 million. The initial interest rate on the Credit Facility is expected to be LIBOR plus 2.0%. "Our ability to attract new capital during one of the toughest lending markets in recent history is a strong endorsement of Allscripts' financial strength and stability," said Bill Davis, Allscripts Chief Financial Officer. For additional detail on the changes to the Credit Facility, please refer to the full agreement, which will be filed by Allscripts with the Securities and Exchange Commission on a Form 8-K.
Allscripts (Nasdaq: MDRX) uses innovation technology to bring health to healthcare. More than 150,000 physicians, 700 hospitals and nearly 7,000 post-acute and homecare organizations utilize Allscripts to improve the health of their patients and their bottom line. The company's award-winning solutions include electronic health record, electronic prescribing, revenue cycle management, practice management, document management, medication services, hospital care management, emergency department information systems and homecare automation. Allscripts is the brand name of Allscripts-Misys Healthcare Solutions, Inc. To learn more, visit http://www.allscripts.com. This press release contains certain statements other than historical facts, which constitute forward-looking statements within the meaning of the safe harbor provisions of the Private Securities Litigation Reform Act of 1995. Readers are cautioned not to place undue reliance on these forward-looking statements, each of which is qualified in its entirety by reference to the following cautionary statements. Forward-looking statements speak only as of the date hereof and are based on current expectations and involve a number of assumptions, risks and uncertainties that are beyond Allscripts-Misys' control and could cause actual results to differ materially from those projected in the forward-looking statements. Risks and uncertainties that may affect forward-looking statements are described in the reports filed by Allscripts-Misys with the Securities and Exchange Commission (the "SEC"), which are available at the website maintained by the SEC at http://www.sec.gov, including without limitation Allscripts-Misys' Annual Report on Form 10-K for the year ended December 31, 2007. Allscripts can give no assurance that any of the transactions related to the Medication Solutions Group will be completed or that the potential conditions to the transactions will be satisfied. Allscripts undertakes no obligation to revise or update any forward-looking statement, or to make any other forward-looking statements, whether as a result of new information, future events or otherwise. Allscripts is not responsible for updating the information contained in this communication beyond the published date, or for changes made to this communication by wire services or Internet service providers.